Since he was 9-years-old, Hayate Ayasaki has been working to pay off his degenerate parents' gambling debts. Before they disappear, the parents sell their son’s organs to the yakuza to cover their debts. Hayate is working various part-time jobs to pay off the debts when fate brings Hayate to teenage heiress, Nagi Sanzenin a/k/a “Ojô-sama.” She is the frequent target of kidnapping plots and of various schemes by people trying to get her money. Hayate becomes Ojô-sama’s butler, zealously protecting her, while she falls in love with him. Then, Hayate has new girl problems. First, his new friend, Ruka Suirenji, thinks that Hayate is a girl because she first meets him when he is Invincible Maidstar. Boy, will he be surprised by Ruka's true profession. Next, he meets a little girl who looks just like the currently AWOL Athena, and she needs Hayate to care for her... and he needs help doing it. THE LOWDOWN: The Hayate the Combat Butler manga continues to be as charming and as entertaining as ever. A parody and send-up of manga and anime tropes and conventions, this series is perfect for the serious otaku. Without spoiling it, Hayate the Combat Butler Volume 28 is a treasure trove of comedy about robots, idols, maid cosplay, and mangaka. Kenjiro Haga adds to his winning cast with new characters and new settings for familiar characters. 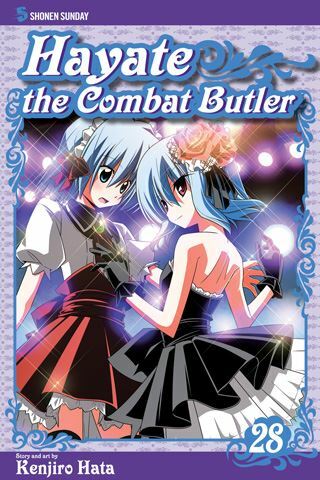 Hayate the Combat Butler is too easy to like... at least to me.